The problem with falling behind, but having a make-up plan, is that if you fall behind on the make-up plan, you’re kind of screwed. And partially, that’s what happened to me. I tapped out of NaNoWriMo last week with 32,907 words written. But also I was at a point where my plot had shifted around a bit. One or two things weren’t working and, instead of piling on more errors, I decided to call it a day on the 50K goal. Since last week, I’ve smoothed out some plot things and some character things. I have an ending in mind, which is a good thing. I’m doing some research and I’m looking forward to starting a 2nd draft/rewrite. I used Mind Meister to put together my plot plan. It’s a work in progress. Today is the first day of November. If you’re a writer, or you hang around writers, you also know that today is the first day of National Novel Writing Month (or NaNoWriMo). World-wide (not just “nationally”), writers of every ilk will endeavor to write 50,000 words on a new novel by the end of the month. But, does anything ever become of what’s written in November? The answer is: yes! In fact, I just released The Case of the Sorrowful Seamstress which has partial origins in NaNoWriMos of the past. I made a first stab at fiction featuring David P. Abbott back in 2012. It’s been a long road between that incarnation and the mystery novellas I’ve ultimately decided to write. As a celebration of NaNoWriMo, The Case of the Sorrowful Seamstress is available for free from Amazon between now (Nov. 1st) and Monday, Nov. 5th! Just head over and download it to your Kindle or Kindle app. I’m participating in NaNoWriMo again this year with a whole new project, though there will still be a magician, a mystery, and probably several murders. No title yet. As of 11/1/18 2pm, I’m 2000 words in, only 48,000 more to go! My goal in November was to put aside Wicked Witch, Retired for a while get a grip on my One Ahead project. One Ahead is a series of short novella mysteries—what I’ve decided is probably the best form for the David Abbott stories I want to tell. My goal is to have three stories finished before I publish them. During November, I wanted to see just how much work I had left on this and actually, you know, do work. I reread the first story. It’s in pretty good shape. It still needs line editing. Rewrote the second story. There are still a few things that need to be cleaned up and maybe a stronger bit of “B” plot to be added, but I think the bones are good. Gathered bits I had written at other points in time and have added them to an incomplete plot framework for the third story. If that sounds particularly Frankensteiny, you’re not wrong. I didn’t get as far as I should have. Word-count wise, not a strong month. I was taking 1/25 of word count for rereading, 1/5 of word count for rewriting, 1/1 of word count for writing new words and only managed a 9344 words. …That’s a long way from 50K. There was a lot of rewriting, something which I am very slow at doing, even if it’s actual word-for-word transcription. There are definitely weeks when I could have gotten more done. I had planned to go back to WWR, but I have some momentum and renewed excitement about One Ahead. My reading schedule for the next month or more is pretty magic heavy as well. This book was a random find from my neighborhood’s free little library. “Faith-based snake handling,” I thought. 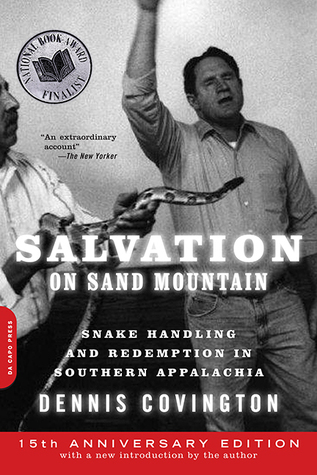 “There’s a topic I never knew I wanted to know about.” Unfortunately, though, Salvation on Snake Mountain has an identity crisis, one that Covington admits to in the 15th anniversary edition’s Afterword. What started out as a news item morphed into something personal for the author, but Covington tries to straddle the line between journalism and memoir, not committing to one or the other. I think that’s to the book’s detriment. Still, an interesting book about something I only knew about as a stereotype. 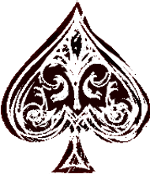 Card picked: 2♠ – Deuces are WILD! Since I’m setting up my list for next year’s Deal Me In, I had no “loose” stories. Instead, through a convoluted wandering around the internet, I landed on an audio collection of Charles Beaumont’s stories and listened to the first one. I was vaguely familiar with Beaumont’s name. Turns out, he’s a golden age speculative fiction author, somewhat renowned for his work on The Twilight Zone TV show. And I ended up listening to a story with absolutely no speculative fiction aspects what-so-ever. Jaunito is a skinny young man, a torero in training, who is miraculously given the chance at a fight with lots of money on the line for him and his mentor Enrique. It is all too good to be true. Sometimes, it’s not just the bull’s blood that the crowd wants to see. I enjoyed Beaumont’s writing, providing a slice of bull-fighting life. But, I do feel like the story is pretty solid. It needs a couple of things cleaned up and it’s a little short. “The Horrid Haunting” could use a more solid B plot. I am a little behind. I wanted to finish the rewrite by last weekend. Didn’t happen. Now, I have two weeks to write the third story. I’ve been going through my notes. Thursday, 11/2 – Intended to reread “The Horrid Haunting” before rewriting, but found that I had at sometime in the past (August 2016, if file dates are to be believed) started a serious pick-apart/rewrite. One file had a bunch of notes and crossouts and one file was only 7100 words long. So, I just dove into a rewrite. Managed to rewrite one chapter. Friday, 11/3 – Been suffering from a flare-up/fatigue since Wednesday afternoon. Blarg. Rewriting on “The Horrid Haunting” continues. This is the back-burner project that I have been working on forever (or rather, five years). My first stab at it was for NaNoWriMo in 2012. The One Ahead series focuses on David P. Abbott, a magician who lived in Omaha, NE at the beginning of the 20th century. Aside from being an accomplished magician, he was a debunker of fraudulent mediumistic practices. I’ll be delving into the history of Omaha in 1915 as well as visiting some of the magicians, mediums, and skeptics that lived in that era. All with a mystery bent. The first story, “The Sorrowful Seamstress,” is pretty much finished. I’m going to give it a reread and maybe some touch-ups. The second story, “The Horrid Haunting,” is finished…I believe…but needs at least a read-through and a rewrite pass. The third story is a nebulous not-quite idea. I’m going to need to plot and write that sucker. Will I get a 50K “word count” out of this? I don’t know, but I have 2-3 other short stories I might work on if it comes to that. Or maybe I’ll come up with a fourth One Ahead story. Is this in the spirit of NaNoWriMo? Maybe not, but I just want an excuse to work like crazy to finish this project.